Win a Multi-YearScholarship, valuedat full day-tuition. The conference, featuring keynote speaker Dr. Sarika Cullis-Suzuki, will highlight how innovative solutions can add up to much needed change. Learn about our 5-day Boarding Option! If you’re considering SMS as your new school, we’d love to meet you and your family! 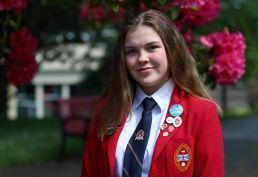 St. Margaret’s School (SMS) is Western Canada’s only all-girls, independent day and boarding school located in Victoria, British Columbia, Canada. Founded in 1908, SMS is an international centre for girls’ learning and leadership development, providing empowering education for girls from Junior Kindergarten to Grade 12 (boarding grades 7–12). Confident girls with dreams become inspired women. Whether they want to be astronauts, accountants, or ambassadors, girls need to know that nothing can stand in their way. What grade level are you interested in for your daughter? SMS is a university preparatory school for girls in junior kindergarten to Grade 12. Our average class size is 10 students to one teacher for a personalized educational experience. Our rigorous, inquiry based approach in Science, Technology, Engineering and Math is a project-based, interdisciplinary model of learning. Our modern boarding school for grades 7 to 12 help students develop skills that prepare them for the postsecondary environment. Our academic programs are supported by a variety of experiential programs designed to engage students in learning beyond the classroom. Our campus facilities feature a LEEDcertified building, modern residences, athletic centre, tennis courts and a West Coast forest. We’re here to help you learn more about our school, come for a tour or even spend a day as an SMS student. Contact Meg Foote in Admissions. We know how to spark their imaginations, cultivate their curiosity and raise their expectations of themselves. Our teachers have the flexibility to adapt how they teach to draw on girls’ strengths, capture their interest, and actively engage them in learning. We are focused entirely on the education, development and well-being of girls, and we provide them with opportunities and experiences they simply won’t have anywhere else. April 25, 6:30 to 8:00 p.m.
Join us for a free lecture series with child psychologist Dr. Jillian Roberts to help families face the complex issues of our modern world. The lecture provides strategies to engage your family in becoming effective problem solvers. Sustaining Our Future is a leadership conference featuring keynote speaker Dr. Sarika Cullis-Suzuki highlighting how innovative solutions can add up to much needed change. SMS is coming to a city near you in 2018 – 2019! SMS Admissions representatives visit countries across the globe each year between August and April. View the ‘On the Road’ schedule. You could be eligible for a $52,500 Centennial Scholarship offering full tuition to a local girl in Grade 9. Entrance scholarships are also awarded for the Middle Years and boarding. Why choose St. Margaret's for Boarding School? For girls who thrive on independence and challenge, St. Margaret’s School provides a welcoming home-awayfrom- home for boarding students for grades 7 to 12. Girls from Canada, China, Japan, Korea, and Mexico share their experiences in this video.